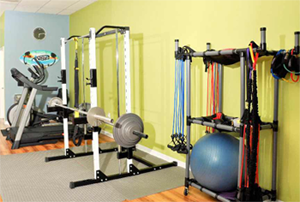 NSP Fitness is a private personal training studio located in Saint Petersburg, FL. We offer fitness solutions for individuals, small groups, sports organizations and businesses. If you are striving to lead a healthy lifestyle, NSP Fitness can help. Whether you are just starting on your road to improving your health or just need to diversify your current routine, we will customize a workout to help you reach your goals. NSP Fitness also offers specialized training to get you ready for your next marathon, triathlon or upcoming competition. If you want to look and feel your best for that upcoming wedding or reunion, contact NSP Fitness today. We understand that traditional large gyms or fitness centers can be intimidating when you are first starting you fitness routine. At NSP Fitness, you will be greeted by our staff in an intimate, relaxing atmosphere. Everyone will receive personalized attention while training at our fitness studio. Starting a new weight loss plan can be daunting, even if you’ve done it before. If you are thinking of starting a new weight loss plan, you’ll find the top ten tips listed in this article invaluable and give you the best possible chance for long term success in achieving your weight loss goals. Nutritional counseling is a type of assessment made which analyzes various health needs in regard to diet and exercise. A nutritional counselor helps people to set achievable health goals and teaches various ways of maintaining these goals . Copyright © 2017 NspFitness.com, All rights reserved. Adress:1108 62nd Ave N, Saint Petersburg, FL.